Try our new & improved version of our previous Green Blend, all the same benefits but in a more effective and powerful formulation! Enhance the power of E3Live™ with this superfood green blend. We've added more E3AFA™ as well as adding E3 Phenalmin™ (which contains PEA, coined as the "molecule of love", this provides emotional uplift and mental alertness for your mind) and E3 AFAMend™ (a natural COX-2 inhibitor with anti-inflammatory properties). This new formula also includes a food-based Vitamin E complex for a smoother taste and overall increased benefits. A proprietary blend of nutritional plant-derived MSM (methyl sulfonyl methane), spirulina, E3AFA™, certified organic cayenne pepper, wild-crafted South American camu-camu, E3 AFAMend™, E3 Phenalmin™, tocotrienol & tocopherol (Vitamin E complex), and crystalloid electrolyte sea minerals. These exceptional foods have been shown to boost the immune system and help your body eliminate toxins. Available in capsules or powder. Mix powder with juice or water. 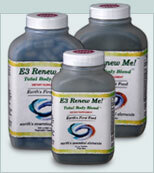 Because of the MSM, E3 Renew Me!™ Emerald Blend™ is contraindicated for anyone with kidney disease. Pregnant women should check with their health care practitioner. Suggested Use: Mix 1 teaspoon in juice, morning and afternoon, or as desired. Maximum benefits occur if taken on an empty stomach. Suggested Use: Take 4 capsules with juice each morning and afternoon, or as desired. Maximum benefits occur if taken on an empty stomach.